Leveraging on our world class facilities and high-tech machinery, we as a Manufacturer, Exporter & Supplier, aim to enchant our customers by distinction. 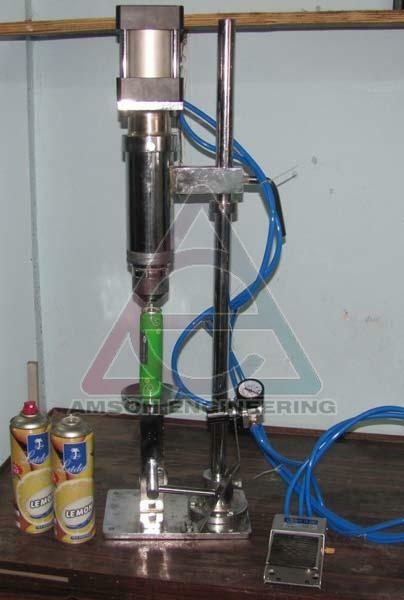 Pneumatic Deodorant Bottle Crimping Machine on offer is available in an assortment of specifications. The excellent material used in manufacturing is of top class quality. The manufacturing process is carried out by a team of skilled professionals who put their utmost efforts to ensure they produce the best possible quality. For our valued customers, we offer it at pocket friendly rates. Pneumatic Deodorant bottle crimping machine is a single head machine, which is the higher version of Hand operated Perfume Crimping Machine. This machine is most suitable for small, medium and lab purposes. Also, this machine is very much useful, where there is less human labour is available. Here, the operating by human hands for crimping is replaced by a pneumatic cylinder. So, ladies can also easily operate this machine for long time. AEACP25 is also made from Mild steel for main body and structure. The tool is made with special material which is machined and hardened to get the correct crimping each time. Operating of this machine is also very much simple. A pedal operating foot switch is provided with the machine to do each crimping. When once pressed, a single crimping is done with perfect tight. The foot switch is very soft to operate. Machine is small in size and can be carried by hands. Each machine is provided with a pneumatic pressure control unit with which we can adjust the air pressure required for usage. The air pressure required for this machine is 5.5 Kg/cm2. The machine is attached with 1” tool, as per production requirements. Tool tightness to the neck can be adjusted as per bottle neck variations with the outer sleeve adjustments. When once the bottle is rested and clamped, the only operation manually done is to press the pneumatic pedal switch. Each pressing and release will do each crimping. Adjustments for heights as per various container sizes can be done with the crimping head, by unscrewing , adjusting and tightening the hand lever at the back side on the head. Maximum net weight for the machine will be 28 kgs. the packing size will be 28” l x 12” w x 14” b. the gross weight including wooden case will be 42 kgs. Number of Collets - 1 , Single Head. Can Crimp Aerosol aluminium/metal containers and other similar bottles. Crimp cap size - 1”, as per STANDARD collet (Tool) size. Crimp Tightness adjustable by set sleeve over the collet.